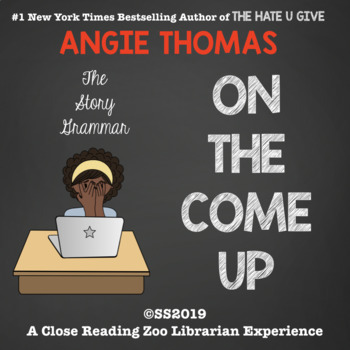 This is a close reading guide to the book On The Come Up by Angie Thomas. High school junior, Bri Jackson wants so badly to be a successful rapper like her late father, Lawless, one of the greatest underground rappers of all time. Scratch that. Bri wants to be a successful rapper like…Bri Jackson. She wants to be her own brand of success. It can be difficult to focus on a career in hip hop when you are labeled a “hoodlum” at school, there may not be food on the table at home, and your aunt is in danger of being caught for selling drugs. Bri has to figure out how to find success in the industry she loves while also remaining true to herself. This is a MUST READ in the middle and high school classroom. While there are many books about overcoming poverty for success available to our students, On The Come Up will give your students a different view of important themes such as racism, poverty, drug abuse, and abuse of power that will truly drive home the issues presented in this novel that are affecting our country every day. This book is a springboard that presents so many wonderful opportunities for reading, writing, and conversation moments within your classroom. One of the great challenges of teaching English Language Arts is ensuring that your students are given adequate instruction in reading strategies, reading comprehension, structure of language, and writing. One of the most important tools I keep in my toolbox is story grammar. Story grammar requires students to practice specific writing skills by asking them to write sentences that are based on their understanding of the text content. As students make their way through On the Come Up, they will practice sentence writing, distinguishing between fragments, generating test questions, using conjunctions to create compound/ complex sentence, beginning sentences with/using coordinating and subordinating conjunctions, using appositives to give more information, sentence expansion, sentence combining, writing questions, and appropriate answers, expanding information from sentence to paragraph and from outline to paragraph, words and phrases when writing an outline, fixing run-on sentence, punctuation, capitalization, verb tenses, topic sentences, supporting details, and quick out lines, all while solidifying reading comprehension skills such as summarizing, synthesizing, and inferencing. This resource has helped me to support the success of many different types of learners in my classroom. It has been a key piece of curriculum when supporting my 9th and 10th grade special education classes, and when practicing writing skills with my general education classes. Please also check out my comprehension question and quote analyses in addition to the vocabulary resource that will soon be available! Please feel free to ask questions before your purchase. AND...don't forget to leave feedback. It's like free TPT money!